The Chromensics tool is developed to read all information from chrome browser directory and present it to user, in easy readable tabular format which can be explored in descent interface without running the chrome browser. The tool will also allow you retrieve information from other chrome installation brought from different machine for analyzing. The acquired artifacts can be exported in PDF report to present it in court of law or to superiors. The PRMitM attack exploits the similarity of the registration and password reset processes to launch a man in the middle (MitM) attack at the application level. 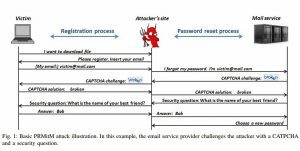 The attacker initiates a password reset process with a website and forwards every challenge to the victim who either wishes to register in the attacking site or to access a particular resource on it.